I went to a funeral yesterday. My great uncle passed away. Three different people spoke at the funeral, including another great uncle. And they all told stories about Uncle Billy. We laughed a lot there, all boxed up in a stuffy funeral home and surrounded by funeral flowers. He wasn’t rich or famous; he was a farmer in a small community. But he was everyone’s friend. Every time you’d see him, there was a big grin on his face. He and my aunt Flora didn’t have children, but they came out and supported all their nieces, nephews, great-nieces, and great-nephews. They attended ball games and birthday parties and concerts. I remember the year we were on furlough they came to a program I was in at school. Uncle Billy also took my children on many tractor rides at his farm. We have a photo stuck up on our refrigerator of him and the kids when they were about 4 and 2 standing in front of the green John Deere tractor. After the burial, we walked around the cemetery and looked at stones of our family members. I pointed the names out to my children, explained who each person was. Finally, we headed to Uncle Billy’s house to gather and eat. The house was full, loud with talk and kids’ squeals and plates stacking. Multiple generations crowded in and shared their stories. My favorite story happened when Billy and Flora were still dating and they’d had a fight. Next thing you know, Billy showed up at the door and asked for Doris, Flora’s sister. Then Doris’ boyfriend showed up and asked for Flora. Later that night everyone made up and they switched back. Those two kids were married for 63 years. I feel like it’s not just the death of our patriarch, it’s the death of the one marriage that has carried us all. Billy and Flora have hosted Christmas for that side of the family since as long as I can remember. I’m glad I went this Christmas, and I got to see him healthy, with his wide smile and quiet voice. I don’t know what it is like to lose your sidekick of 63 years. I’m sure when everyone finally goes home, it will be very hard for Aunt Flora. But for a few hours yesterday, we enveloped time. We rescued it, we pulled every atom out of decay and death and aging and we let our memories free in the timelessness. They say that God is enough for grief. His comfort and presence are enough. But I have been through this, and I am here to tell you: God is not enough. When someone beloved dies, God is distant. The gulf between you and him is immeasurably wide. People talk about him, but they don’t understand that their words don’t help. Your loved one is gone. And God feels gone, too. People read the Bible to you, and they mean well, but those verses aren’t enough. They won’t bring your person back. They won’t breathe life back into him or her. We say we believe that the Holy Spirit is in God’s people, but we never act like we really believe that. We contain God to abstract feelings and an abstract place and centuries-old verses. A real live person showing they care is better than a Scripture verse any day. Why can’t that be God? Can’t the caring, loving gestures of a person be God? You might not call it God; you might call it love. I might call it that, too. I don’t care what you call it, really. But I remember a story about this person who, when he was dying, looked down and asked his friend to take care of his mother. Even Jesus knew that grief needs company. Grief needs the touch of another human. It won’t take the grief away, but it might lighten the load just a little bit. By the time I left my aunt and uncle’s house last night, it was dark outside. I drove down the country roads and saw the moon, just a sliver of light at the bottom. But I could see the round shadow of it, the hint of something else, something more. Sometimes I wonder what secrets life – and the afterlife – hold. I thought of Uncle Billy, and I thought about light and shadows, seen and unseen, wonder and secrets. 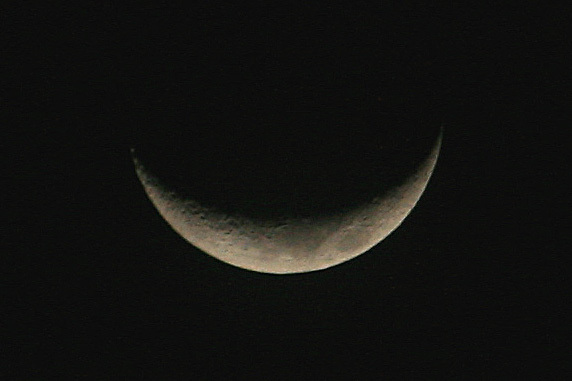 That crescent of moon looked just like a Cheshire cat smile, which means it looked like Uncle Billy’s smile. I don’t know what all this means. I feel like I don’t have the words for it. But I feel the pull of time on all of us, and I also feel the movement of turning time inside out and letting it live. I feel the merging of past and present and future, all converging just under my skin, somehow miraculously changing me. Profound and beautiful. Thank you, Karissa. “A real live person is better than a scripture verse anyday”. I love that Karissa – it’s so true. When dad passed away, out family friends the Robinsons came and stayed with my mom for as long as she needed. They ran the household for her: taking calls, answering the door, keeping things clean – really running the “show” – which is what the funeral felt like. But they’re still there for mom….and always will be. They went on a vacation together recently and when Jim would look at my mom (Jim was Dad’s best friend), their eyes would well up as they knew my dad is never coming back. They were there. Insightful. I feel a poem coming on, “In Your Shadow”.